Bonnie Hunter mentioned that she tried Windows Live Writer. A few months back I ended up with a new laptop. I thought that I would try it also. The quilts and runners for Christmas Traditions were gone before pictures were taken. For Christmas Traditions, I helped with one of the open houses. One of our quilters in the group opened up her house. Two doors down is another woman from our group. She is a long time quilter. She stopped quilting back in 2001. She was a handquilter and a handpiecer. On display were over 25 quilts. I was asked to help turn quilts and talk about patterns. It was enjoyable, not only to spend time with a friend, but also to see area women (all visitors were women). It was fun to see her inspire those around us. She is now 85 years old. She square dances and is very active. I can only hope that one day I will be brave enough for an open house and show my work. I have failed pretty miserably to complete quilts in my UFO list for 2010. I did some quilting on one of the quilts but did not finish a single quilt on the list. That is not to say that I did not work on any quilts. 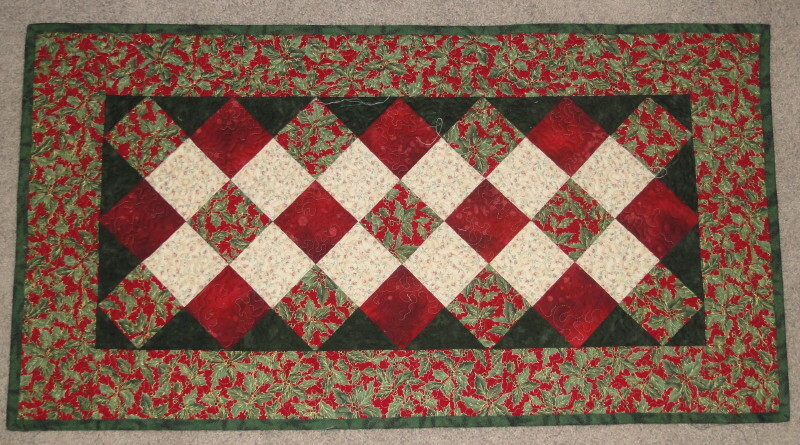 It is to say that I only finished the Christmas Traditions quilt. I have decided to sign up for Judy L.’s UFO challenge. I really need a deadline. Here is how it is working. We pick 12 projects and number them. Each month she will pull and number. We will have to finish that project within the month. We also need to adapt the challenge for ourselves. I have some tops that need to be finished and some tops that need to be quilted. I will keep you informed on how things are moving along. What number do you think will get drawn first? I have my favorites. I just hope that I can make some progress and show finished projects.